Following the German attack of 17-18 March 1917 on the anti-submarine net barrage in the Dover Straits, the Admiralty told Vice Admiral Sir Reginald Bacon, C.-in-C. Dover, that his forces should be more concentrated on nights when enemy attack appeared to be likely. The night of 20 April appeared to be such a night, as it was there was a new moon the next day and high water was at 2230. The British had two flotilla leaders (large destroyers) on the western part of the barrage and four destroyers to the east. There was a light cruiser, a flotilla leader and three destroyers and a monitor protecting shipping in the Downs, off the east coast of Kent and six destroyers at Dover. The Germans had strengthened their destroyer force at Zeebrugge by transferring Korvettenkapitän Kahle’s 3rd Flotilla from the High Seas Fleet. The operation on 20-21 April was to be controlled by Kahle. He would not be at sea but instead would command from Bruges, where the Germans collected and deciphered intercepted British orders. According to the British Official History, two groups would again attack the net barrage, but this time there would be no raid on the Downs. The force on the Dover side of the straits consisted of six destroyers from the 3rd Flotilla (822-960 tons, three 10.5 cm (4.1 inch) guns, six 50 cm (19.7 inch) torpedo tubes, 33.5-34 knots). That on the Calais side comprised four from the Zeebrugge Flotilla and two from the 3rd (852-990 tons, three 105 cm guns, six 50 cm torpedo tubes, 32-34 knots). However, Mark Karau’s history of the German naval forces in Flanders during the First World War says, based on German archives, that the Calais force included only three destroyers, with the other three operating in the Downs. A bombardment of Calais started at 2310 and one of Dover at 2330. Little damage was done to either town but the armed trawler Sabreur was damaged at Dover. British batteries returned fire but without hitting the enemy. However, the bombardment caused Bacon to keep his Dover destroyers in port until 2355, by when the Germans had gone. At 0038 on 21 April, the Dover raiders sighted the flotilla leaders HMS Broke (1,610 tons, six 4 inch and one 1.5 pounder (20mm) guns, two .303 inch MGs, four 21 inch torpedo tubes, 31 knots) and Swift (2,170 tons, one 6 inch and two 4 inch guns, two 18 inch torpedo tubes, 35 knots). Broke was named after Sir Philip Broke, a successful frigate captain from the War of 1812. Firing commenced at 0044. Swift, which was ahead of Broke, turned towards the German line with the intention of ramming one of the smaller German ships. She missed and was hit by several shells, but one of her torpedoes hit SMS G85. Swift then pursued the Germans as far as the barrage but then had to give up because a shell hole had caused flooding in one of her forward compartments. Broke also fired torpedoes and attempted to ram a German destroyer. She missed first time but struck SMS G42 with her second attempt. She took several minutes to extricate herself, during when she came under fire from two other German destroyers. She tried to pursue the Germans but was too badly damaged to keep up with them. She therefore returned to G42, which was sinking by the stern but fired on Broke, which replied until the German guns fell silent about 0120. Broke’s engines then broke down and she began to drift towards G42. Some other British destroyers then arrived and took Broke under tow. G42 and G85 both eventually sank. The British picked up about 100 survivors from crews of 87 and 85 respectively. British losses were 40 killed or wounded on Broke and one killed and four wounded on Swift. The British casualties are listed on Naval-History.net. The two British captains, Commander Ambrose Peck of Swift and Commander Edward Evans of Broke, were awarded the Distinguished Service Order and promoted to Captain. Evans became a national hero as ‘Evans of the Broke‘ and reached the rank of Admiral, serving in the 1940 Norwegian Campaign. He had previously been second in command of Captain Robert Scott’s ill fated 1911-13 Antarctic Expedition. The losses from this operation caused a change in German strategy. Future attacks would be aimed at the Netherlands to UK convoys rather than the Channel patrols and barrage. Naval Staff Monograph (Historical) 1922 vol. vi, The Dover Patrol i. p. 97. J. S. Corbett, H. Newbolt, Naval Operations, 5 vols. vol. iv, , pp. 373-74..
 Ibid. vol. iv, p. 378; R. Gray, Conway’s All the World’s Fighting Ships, 1906-1921, pp. 168-69. M. D. Karau, The Naval Flank of the Western Front : The German Marinekorps Flandern, 1914-1918, p. 124. Naval Staff vol. vi. p. 98; Corbett, Newbolt, Naval, p. 375; Karau, Naval, p. 125. Gray, Conway’s 1906-1921, pp. 73, 77-78; Karau, Naval, p. 125.Karau gives German times that were an hour ahead of British time. All times quoted have been adjusted to British time. Naval Staff vol. vi. p. 99; Karau, Naval, p. 125. Corbett, Newbolt, Naval. vol. iv, pp. 377-78. Ibid. vol. iv. p. 378; Gray, Conway’s 1906-1921, pp. 168-69. 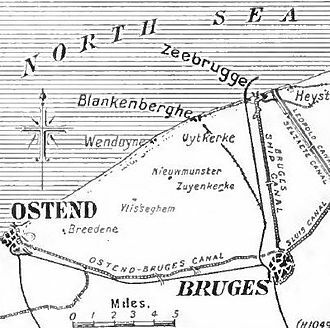 The Germans attempted to repeat their successful attack of 26-27 October 1916 on the Dover Straits anti-submarine net barrage and shipping on 23 November 1916, but it and a raid of 25-26 February on shipping between England and the Hoof of Holland did little damage. 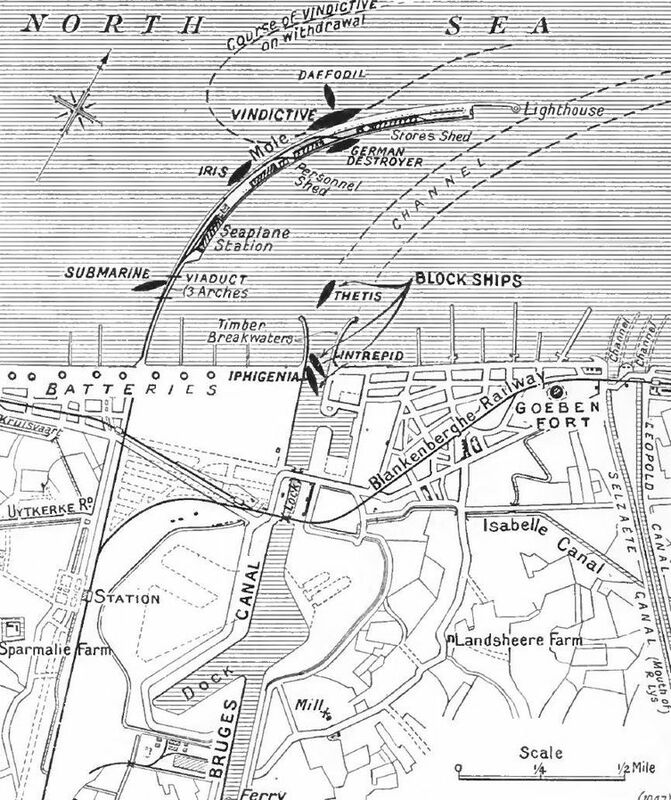 A new attack on the Dover Straits was planned for 17-18 March 1917. Seven destroyers (802-960 tons, three 10.5 cm (4.1 inch) guns, six 50 cm (19.7 inch) torpedo tubes, 33.5-34 knots) of the 6th Flotilla would operate in the western half of the Dover Straits, five (852-990 tons, three 105 cm guns, six 50 cm torpedo tubes, 32-33.5 knots) of the 1st Zeebrugge Half Flotilla in the eastern half and four (568 tons, two 88 mm (3.45inch) guns, four 50cm torpedo tubes, 29 knots) of the 2nd Zeebrugge Half Flotilla in the Downs off the east coast of Kent. Korvettenkapitän Tillesen of the 6th Flotilla would lead the attack. Tillesen planned the operation carefully in order to give each group of destroyers separate lines of approach and areas of operation. The British had the K class HMS Paragon (1072 tons, three 4 inch guns, two 21 inch torpedo tubes with 4 torpedoes, 29 knots) and three L class (965-1010 tons, three 4 inch guns, one .303 inch MG, four 21 inch torpedo tubes, 29 knots) destroyers protecting the net barrage, a light cruiser, a flotilla leader, four destroyers and two monitors off Deal and a flotilla leader and five destroyers at Dover. At 2250 HMS Paragon encountered three or four destroyers. She exchanged gunfire with them and fired a torpedo that hit a German ship without exploding. Paragon then blew up and sank with the loss of all but 10 men. HMS Laforey, assuming that Paragon had struck a mine, stopped at about 2300 and switched on her searchlight in order to see and pick up survivors. About 2315 she was narrowly missed by a torpedo that damaged HMS Llewellyn. Laforey’s captain assumed that it had come from a U-boat so set off in search of a submarine. Other British ships therefore remained in port. The German destroyers attacking the Downs came across the SS Greypoint, which was anchored in an exposed position because her engines had broken down. They torpedoed and sank her, damaged a drifter and bombarded Broadstairs and Ramsgate without causing much damage, although some civilians had narrow escapes. They then withdrew, outpacing Torpedo Boat 4, the only British warship to spot them. The British casualties are listed on Naval-History.net. J. S. Corbett, H. Newbolt, Naval Operations, 5 vols. vol. iv. pp. 361-62; R. Gray, Conway’s All the World’s Fighting Ships, 1906-1921, pp. 168-69; P. G. Halpern, A Naval History of World War I, p. 348. Corbett, Newbolt, Naval. vol. iv. pp. 361-62; Gray, Conway’s 1906-1921, pp. 75-76. Naval Staff Monograph (Historical) 1922 vol. vi, The Dover Patrol i. p. 92. The English Channel, especially the Dover Straits at its eastern end, was one of the main Allied shipping routes during the First World War. It saw a variety of different types of traffic: supplies and troop movements for the British Expeditionary Force in France and Flanders; shipping heading for London, Britain’s biggest port; coastal shipping sailing between British ports; and coal shipments from Britain to France to replace supplies from French coalfields now occupied by the Germans. About 80-100 merchant ships passed through the Dover Straits each day. German U-boat minelayers of the UC type were very active in minelaying in this area. The British employed trawlers as minesweepers. In the second half of 1916 an average of just under six merchant ships per month were sunk or damaged by mines in British waters. This rose to 10 in the first half of 1917 but then fell back to four in the second half of 1917. On average 178 mines a month were swept in 1916, rising to 355 in 1917. An anti-submarine net barrage was also laid across the Straits, which was maintained by drifters, but in practice tides and current made the task of such small craft difficult even in good weather. They were at best armed with a 6 pounder gun and sometimes with just a machine gun, requiring them to be protected by destroyers and armed auxiliary steamers. On 24 October 1916 Vice Admiral Sir Reginald Bacon, commanding the Dover Patrol, was warned that the German naval forces in Flanders had been reinforced by a flotilla of destroyers. He thought it unlikely that the Germans would attack the Straits because no troops were transported at night but that an attack on shipping in the Downs, an area off the north east coast of Kent, was likely. He had defending Dunkirk the flotilla leader HMS Swift (2,170 tons, four 4 inch guns, two 18 inch torpedo tubes, 35 knots), four modern L class destroyers (966-1010 tons, three 4 inch guns, one .303 inch MG, four 21 inch torpedo tubes, 29 knots) on loan from the Harwich Force and four old destroyers, called 30 knotters because of their design speed (310-70 tons, one 12 pounder (76mm) and five 12 pounder (57mm) guns, two 18 inch torpedo tubes, 30 knots). Four more L class destroyers were at Deal, defending the Downs. Six Tribal class destroyers (855-1090 tons, two 4 inch or five 12 pounder (76mm) guns, two 18 torpedo tubes, 33 knots), two 30 knotters, two old torpedo boats (specifications varied but would have been small than the 30 knotters) and a P boat (613 tons, one 4 inch and one 2 pounder (40mm) AA guns, one 14 inch torpedo tubes, 20 knots) were at Dover. The Tribals were assigned to the Dover Patrol because of their poor endurance. The P or Patrol boats were a wartime design with a low freeboard, a sharp turning circle and a deliberate resemblance to submarines, which it was hoped would allow them to close on U-boats and sink them by gunfire or ramming. The wide range of displacements was a consequence of a British policy of giving different shipyards some discretion over ship design, provided that various criteria for speed, range, protection, armament etc were met. That night 24 German destroyers put to sea, commanded by Kapitän Andreas Michelsen, commodore of the High Seas Fleet’s flotillas. They were divided into two flotillas, each split into two half flotillas. The 3rd Flotilla consisted of the 5th (seven ships) and 6th Half Flotillas (six ships), all armed with three 105mm (4.1 inch) guns and. The 9th Flotilla was made up of the 17th (six ships) and the 18th Half Flotillas (5 ships), armed with either three 105mm guns or three 88mm (3.45 inch) guns. All had six 50 cm (19.7 inch) torpedo tubes. They displaced 800-960 tons and were capable of 33.5-34 knots. The Germans called them High Seas Torpedo Boats but they are referred to as destroyers here as they were comparable to British destroyers. The 9th Flotilla was to attack the transport line between Dover and Calais and the 3rd the drifters and the barrage. Each Half Flotilla would have its own area of operation. The 30 knotter HMS Flirt, supporting the drifters, saw but did not identify German destroyers at 2135. The Germans opened fire on the drifters just after 2200. They sank six out of 28 drifters, a trawler and HMS Flirt. The other drifters were able to escape into the darkness, though three were badly damaged. The six Tribals at Dover were ordered to put to sea at 2250. Five minutes later the four L class destroyers at Dunkirk received the same instruction. The L class ships in the Downs were supposed to remain where they were but instead headed for Dunkirk because of two signalling errors. Fortunately for the British the Germans did not attack the Downs. The Germans attacked the transport line between 2300 and 2330 but sank only one of the 57 ships crossing the Channel, the transport Queen, whose crew were first allowed to board her lifeboats. The Tribals failed to concentrate but came into contact with the 9th Flotilla as it withdrew from its attack on the transport line. HMS Nubian came under heavy fire at close range. She attempted to ram the last German torpedo boat but was instead torpedoed in the bow. She was put out of action and had to be towed back to port. HMS Amazon, which had become detached from the other Tribals, encountered some destroyers that he captain assumed were L class ships. They were Germans., who opened fire, putting her after gun and two boilers out of action. They also damaged a trawler. HMS Viking, Mohawk and Tartar engaged the Germans but a shell hit Mohawk and jammed her helm. Tartar followed her and Viking had to change course to avoid a collision, with the result that contact was lost. The Dunkirk destroyers saw gun flashes but were too far away to get into action. This action showed that the barrage had limited effect, as 14 British destroyers had crossed it without being damaged. Nubian was too badly damaged to be repaired. On 8 November her sister ship HMS Zulu had her stern blown off by a mine. The two ships were put together by Chatham Dockyard and the combined ship was commissioned as HMS Zubian on 7 June 1917. She was credited with sinking the U-boat UC50 on 7 January 1918. The Germans sunk six drifters, a trawler, an empty transport ship and a torpedo boat and damaged two destroyers and several auxiliaries, suffering only minor damage to SMS 91 in return. British human losses were 45 dead, four wounded and 10 captured. The dead included all the crew of Flirt, except for a boat party that had been lowered just before she was sunk to pick up survivors from the drifters. The German success was helped by their previous inactivity, which made the British complacent. M. Faulkner, A. D. Lambert, The Great War at Sea: A Naval Atlas 1914-1919, p. 105. L. Sondhaus, German Submarine Warfare in World War I: The Onset of Total War at Sea. Kindle Edition, locations 1902-50. Naval Staff Monograph (Historical) 1922 vol. vi, The Dover Patrol i. pp. 69-70; R. Gray, Conway’s All the World’s Fighting Ships, 1906-1921, pp. 71-72, 76, 96. J. S. Corbett, H. Newbolt, Naval Operations, 5 vols. vol. iv, p. 52 and footnote 2; Gray, Conway’s 1906-1921, pp. 168-69. Corbett, Newbolt, Naval. vol. iv, pp. 55-57; Faulkner, Lambert, Great, p. 113; M. D. Karau, The Naval Flank of the Western Front : The German Marinekorps Flandern, 1914-1918, p. 77. Corbett, Newbolt, Naval. vol. iv, pp. 58-62; Faulkner, Lambert, Great, p. 113. Naval Staff vol. vi. p. 82. Gray, Conway’s 1906-1921, p. 72. Karau, Naval, pp. 77, 79.